Don’t Be Shy. This AI Robot Just Wants to Help You Get Dressed. It can only put one human arm into a hospital dressing gown, but, hey, it's a start. We’re officially one step closer to living like the Jetsons. Well, one arm closer, at least. Researchers from Georgia Tech are working on a robot that can help a person get dressed. So far, it can successfully thread one sleeve of a dressing gown onto a person’s arm. So, not exactly the same technology that helped Mr. Jetson get ready for work each day. But it’s a start. The team plans to present its research at the International Conference on Robotics and Automation (ICRA) in Australia next week. 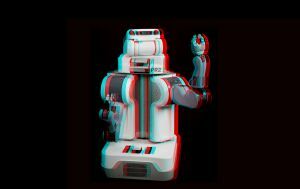 The robot is a PR2, a pre-built bot that researchers can modify to perform a number of (mostly menial) tasks, from folding laundry to making a latte. To train their PR2 to help people get dressed, the Georgia Tech team first let it analyze almost 11,000 simulated examples of a robot putting a dressing gown onto a person’s arm. These simulations, taken from prior research, estimated the force needed to place a garment on various parts of the human’s arm as the robot attempted to dress them. Some simulations depicted the robot successfully completing the task, while others displayed alarming failures, such as the bot applying “dangerous forces to the arm,” according to a Georgia Tech news release. Don’t do that, robot. Arms are not meant to be crunched by robot hands. After just a single day of analyzing these simulations, the PR2’s neural network learned about how much force it would need for each of the different motions it applied to the human’s arm. Essentially, it learned what it would “feel like” to be on the human end of the equation, as the Georgia Tech release notes. The robot also learned exactly which motions it would need to put on that sleeve in a way that would be easiest for the human wearer. If the robot pulled the gown in a particular way, it might be hard for the person to slip their hand in the hole (that’s not ideal), while pulling it another might slip the gown easily over an elbow or shoulder. Once the PR2 proved it could successfully simulate the task, the team brought out its human subjects. Through some real-world trial and error, the researchers figured out that the robot achieved the best results when it was able to “think” about one-fifth of a second ahead of executing each action. Now, it takes the robot about 10 seconds to pull a gown over a person’s arm. Pretty good, right? Fully dressing a person in a gown, however, is still several steps away; dressing a person in clothing other than a hospital gown is an even more remote possibility. And given how many steps it took just to do a single sleeve, it might take a long time to get there. Being naked in front of a robot that isn’t totally sure how much force to exert on your body might be a scary prospect to the average person. But if the researchers can train the PR2 to place an entire hospital gown (we’re talking both sleeves), it could prove life-changing for the 1 million Americans the researchers estimate can’t get dressed on their own, either due to advanced age or physical ailment. A robot that could do that might relieve some of the work caregivers and nurses do every day. That would be a the top priority, of course. But someday, if the robots get even more sophisticated, they could give the average person a few more minutes in their day by taking on some of our more menial tasks, including the burden of dressing ourselves.